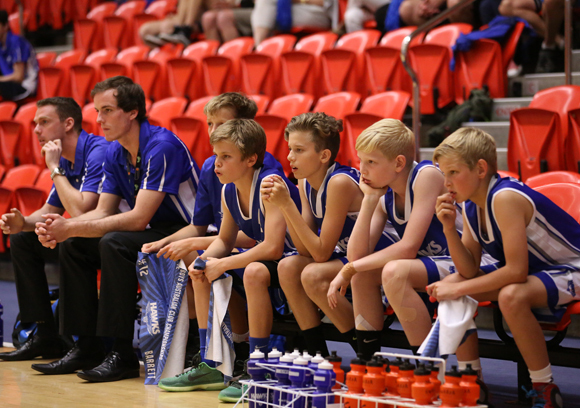 Results and top performers from Day 2 of the Australian U14's Boys Club Championships being held in Perth, Western Australia. A 16-0 run to start the game fueled by some good full-court pressure by Casey saw them jump out to an unassailable lead although the front court of Tamworth showed their composure by competing until the final siren. Cairns pushed the ball early and forced several turnovers to put the Foresters on the back foot and they continued to push for the entire contest to run out convincing winners. The Rebels scored the first seven points on the game before the Cougars fought back to tie the match and this sequence repeated through most of the game. In the end, a dominant performance on the boards in the fourth quarter secured the win for Gosford. Whilst Darwin battled hard, it was a matter of Keilor being too big and too skilled as they ran out convincing winners 97-15 in a clinical display. A see-sawing first quarter saw both teams exchange baskets and defensive stops but a strong second period at the defensive end gave the Lions a 13-point lead at the main break. Canberra came out strong in the second half but Central District held strong and ran out comfortable winners. In an evenly matched contest, Willeton took a two-point advantage into half-time but it was not until the final term when they were able to gain some breathing space and truly put away the defiant Comets. Sturt's size, led by Aimable Ciza and Sebastian Griffin, caused problems for the Braves as they extended a nine-point lead at quarter-time to 20 at the main break. A barrage of three-pointers from Bendigo threatened an upset but the Sabres were able to keep their unbeaten record in tact. Finding their feet after a slow start, the Thunder were in the contest at half-time but a physical third term saw the Spartans assert their dominance and pull away for a convincing victory. After a few turnovers from both sides early, the Bears latched on to a few easy fast breaks and did not look back. The Suns were able to dig deep, going on a 12-4 run in the second quarter but the ball movement and shot selection from Norths proved too good. A 26-0 run in the first quarter was the catalyst for the win as Paul Tsapatolis collected 26 points and 18 rebounds while Lachie Gunner (18 points) and Joshua Giddey (16 points) also starred. Bulleen took the ascendancy early with a 6-0 run and their ability to score fast break points off turnovers helped them consolidate the lead. North Adelaide made them fight for the victory when they cut the lead to single digits in the final term but the streak came too late as Bulleen hung on. Although the Rip could not contain Perry Lakes' multiple scoring option, Riley Curtis continued his incredible offensive performance with 20 of Sunshine Coast's 23 first-half points before he went on to record an amazing 51 in the losing effort. For the Hawks, the front-court duo of Daniel and Nathan Thomas combined for 53 points. Tamuri Wigness was outstanding for the Marlins, showcasing his incredible athleticism at both ends of the floor to carry his side to victory against a Thunderbolts team that fought bravely until the final siren. Casey took the lead early in the game and continued to do the small things well to build on that margin quarter-by-quarter. While the Northern Tasmania Foresters hung in the game in the first quarter, it was a dominant third quarter where the Victorians outscored their opponents 21-7 that put the game beyond doubt. All Casey players bar one scored for their team, with four players managing a double-digit scoring performance. An all-round team performance finally led to the Cavaliers putting away the Foresters by an impressive 40 points. A vocal crowd spurred Cockburn on as they got off to a flying start. They had doubled Darwin's total by half-time and without taking their foot off the gas, ran out victors in a clinical performance. Continued pressure right through the contest saw Keilor extend their lead at every change although the Rebels fought their way back into the contest once they became accustomed to the defensive intensity in the second half. Canbera scored the opening points of the match and were valiant throughout the match but a complete performance at both ends of the floor saw Sydney run away in the end. The Lions began with a 10-0 run but Willeton quickly responded to close within two points. Eight points in the second term from Kalani Sapwell (27 points overall) helped Central Districts jump back out to a double-digit lead and they were never headed from that point, despite a strong showing from Roosevelt Williams (15 points).